We are really excited to announce that applications for our Graduate Design Scheme are now open for junior designers! 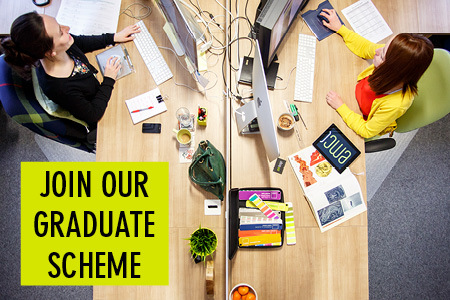 If you’ve graduated with a degree in graphic design or typography within the last two years and want to learn on the job, in a supportive and professional team, then our graduate scheme should be right up your street. We’re looking for people who have an eye for detail, creative flair and want to join our graduate design scheme at junior level with a view to progressing through the company. emc design is a leading design agency for the publishing industry. We’ve been helping to shape content for 25 years and we passionately believe that great design helps to make great content. The company has always had the ethos of bringing in design graduates with the aim of training them in-house, on live jobs from day one. And our culture is to nurture and develop already very talented designers who have been taught the fundamental basics of good design at undergraduate level, including typography, information design, layout skills and concept development. We look for people who have the enthusiasm and potential to become the very best editorial designers. You can read more about the scheme and why it might be a good fit for you here. To apply send us your CV and portfolio (in PDF format please) to jobs@emcdesign.org.uk by Friday 29th July. Interviews will take place throughout August and we’d like our new graduates to start asap, preferably by September. This is not an internship/work experience, this is a real job with amazing career prospects for designers wanting to start their career. Starting salary £17,500 with reviews (at appraisals), bonus scheme, paid overtime, contributory pension, relocation allowance, CycleScheme, ComputerScheme, Employee Assistance Programme and more!